Water is the most abundant liquid in nature. It is a compound of hydrogen and oxygen. It occurs on land as seas, oceans, rivers, springs, wells, etc. It also occurs in the atmosphere as rain, water vapour, clouds, etc. Water is the essential constituent of animal and plant life. Without water, no life could exist on earth. All living things need water to survive. About 60% of the human body by mass is made of water. A human being needs to drink about 2 litres of water per day to replace the water lost from the body via sweat, urine, breath, faeces, etc. If you did not replace this by eating and drinking, you would die in a matter of days. Water is more important than food. A human being can survive without food for many weeks, but will die in a few days without water. So without water, no life can be sustained. Water is the main constituent of the earth's surface. 70% of the earth's surface is covered by water. The remaining 30% is covered by land. There are four kinds of natural water namely, rain water, spring and well water, river water, and lake and sea water. Natural water is never pure. Water from difference natural sources contains substances dissolved in it. This is naturally distilled water. It is almost pure and it contains only gases and dust dissolved from the air. If the dissolved gases are acidic, e.g. sulphur dioxide, carbon dioxide or nitrogen dioxide, they may form "acid rain". In heavily industrialized countries where emission of these gases is very great, acid rains have been experienced. Rain water in non-industrial areas is fairly pure. It is safe to drink though it is tasteless. The taste in water is due to dissolved substances in it. When the rain falls, some water sinks into the ground to form ground water. This water percolates down the earth until it meets layers of impervious or impermeable (non-porous) rocks, which stop it from percolating or seeping any further. The ground water may reach the earth's surface as a spring. When a whole deep enough is dug to reach the ground water, a well results. Spring or well water is supposed to be clean, although it contains dissolved substances. As water passes through the earth, it is naturally filtered. River water contains dissolved and suspended solid materials. The water in some rivers is very muddy or sandy depending on the nature of the land from which the river originates and on which it flows. Most of the water we drink or use at home and industries is from rivers. To make the river water fit for use, all the substances dissolved and suspended in it must be removed or filtered. Lakes and seas receive water from rivers. River water contains dissolved salts. As it flows through the land, some of its water evaporates into the air. When it reaches the sea or lake, more water still evaporates. As a result, sea and lake water will necessarily contain vast quantities of dissolved substances. Sea water contains about 3.6% by mass of the dissolved solids. Most of the dissolved solids compose largely of sodium chloride that can be obtained from sea water in large quantities. Three quarters of the ocean salts is sodium chloride (common salt). Heat from the sun causes water to evaporate from exposed water bodies such as oceans, seas, lakes, rivers dams, etc. This causes huge amounts of water vapour to float (laden) in the air. The vapour rises up. In the cooler upper parts of the atmosphere, the vapour cools and condenses to form tiny water droplets. The droplets form clouds. The clouds are drifted by wind. They cool further, and the droplets join to form larger drops of water which fall down as rain due to gravitation pull. On the other hand, if the air is very cold, they fall as hail, sleet or snow. The whole process is called precipitation. Some rain water soaks, and reappears as springs. Some flows over the ground as streams. The springs and streams feed rivers. The rivers flow to the ocean, sea or lake. The whole cycle starts again. Everyone understands why it is so important to keep our water clean. The fresh water that is available for use by people, plants and animals must be clean and safe. Sometimes human carelessness pollutes the water system, loading harmful and unhealthy substances into the system at a rate that exceeds its natural restorative capabilities. When harmful substances are discarded (disposed off; dumped) into the environment, they may very well end up as part of the water cycle. An example of these acts may happen when untreated municipal and industrial wastes are directed into the water bodies such as rivers, lakes and seas. These substances are toxic and may harm human, marine, animal and plant life. When chemicals are released into the air, they might well return to the earth with rain and snow or by simply settling. For example in industrial areas, sulphur dioxide dissolves in water from the clouds and with oxygen from the atmosphere to form sulphuric acid. This then falls as "acid rain". The acid rain washes salts from the top soil. Acidic water and metal salts run into the lakes or rivers. The introduction of these new substances consequently increases the acidity and concentration of metal salts in the lake, river or stream. As a result, fish and other marine life die. Nitrogen oxides, NOx, can also cause acid rain. When nitrogen dioxide gas reacts with water and oxygen in the atmosphere, the result is a weak solution of nitric acid. Carbon dioxide also reacts with water in the atmosphere to form a weak carbonic acid (rain water). Pure water has a pH of 7.0. Normal rain is slightly acidic because of the carbon dioxide gas dissolved into it. It has a pH of about 5.5. It has been confirmed that carbon dioxide (CO2), sulphur dioxide (SO2) and nitrogen oxides (NOx) are the primary causes of acid rain. When harmful substances are dumped on land or buried in the ground, they might well find their way into ground water or surface water. These substances contaminate the water, which may be someone's or some community's drinking water. Water plays an important role in the conservation of the environment and in determining human settlement and development. It also governs plant and animal distribution. Animals and plants, as components of the environment, are mainly concentrated in water or in areas where water is found. Plant roots bind the soil particles together, making the soil compact and less susceptible to erosion. However, vegetation will only grow and flourish on land that receives sufficient rainfall. This is possible only if the water cycle is properly maintained by conserving natural forests and planting more trees to attract rainfall. So it is obvious that there is a strong relationship between rainfall (as a crucial stage of the water cycle) and the vegetation and soil (as components of the environment). We use water from the lakes, rivers, wells or springs to irrigate crop and non-crop plants. 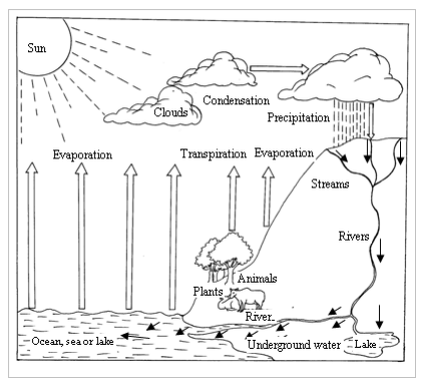 So, when we distort the water cycle in some way or the other we may not have enough rainfall to fill up rivers or springs from which we obtain the water we use to conserve our environment (vegetation). Properly watered soils support more plants. We all know that plants absorb carbon dioxide from the atmosphere, therefore, helping to purify the air naturally. In addition, plants produce oxygen gas, which is needed by all living organisms. If there is not enough rainfall, most plants will die, hence resulting to excessive accumulation of carbon dioxide, which may rise to toxic levels. Excessive carbon dioxide in the atmosphere leads to intense heating of the earth's surface, a phenomenon described as global warming. The consequence of global warming include encroachment and extension of desert and arid lands, prolonged droughts, changes in rainfall patterns, etc. These few facts show that there is a strong relationship and correlation between environmental conservation and the water cycle. Environmental degradation can lead to serious and irreparable aftermath to the water cycle. Perfom simple experiments on physical and chemical properties of water. Extremely pure water is colourless, odourless and tasteless. The colour, taste or odours in water are due to dissolved impurities of organic and inorganic nature. Pure water is a very poor conductor of heat and electricity. However, water containing some dissolved inorganic impurities may conduct appreciably. Pure water freezes at 0ºC. Pure water boils at 100ºC at a pressure of 760 mmHg; and pure water will boil away completely with no change in temperature. 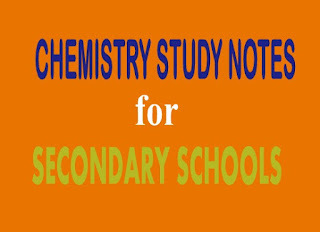 Its melting point and boiling point are abnormally high due to hydrogen bonding. It is the only substance that occurs naturally in all the three states of matter – solid, liquid and gas. Water, as compared to other liquids, dissolves almost all substances, though in varying degrees of solubility. For this reason, water is usually called the universal solvent. It has a high surface tension than other liquids. It has a high specific heat index, which means that it can absorb a lot of heat before getting hot. It is miscible with many liquids, for example ethanol. The maximum density of pure water is 1 g cm-3 at 4ºC. When water is cooled gradually, it reaches its maximum density at 4 centigrade. The actual change from water to ice takes place at 0ºC. Pure water is neutral to litmus and has a pH of 7.0. Water expands when it freezes. Most substances contract when they change from liquid to solid state. Water is one of the very few substances that expand when they freeze. This behaviour is called anomalous expansion of water. Ice is therefore much less dense than water. The water molecules in the ice crystals are further apart from each other than in liquid water. It can be seen that water attacks metals differently depending on the metal’s position in the activity series. 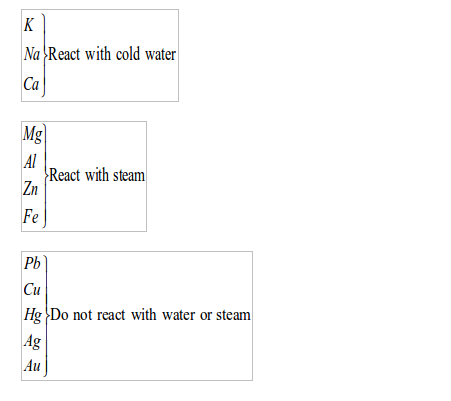 This is called the chemical activity series of metals. Potassium is vigorously attacked with cold water, producing hydrogen gas. The reaction of water with potassium is very violent and the hydrogen produced catches fire spontaneously with a lilac flame. The colour is due to the burning of small quantities of potassium vapour. The reaction of sodium with water is vigorous but the hydrogen liberated does not catch fire. Sodium reacts with cold water to produce hydrogen gas, which is detected by effervescence as the gas is liberated. If a flame is applied, it burns with a yellow flame (the yellow colour is from sodium). Calcium reacts with water relatively slowly compared to sodium and potassium. The gas (hydrogen) given off explodes if mixed with air, and if a flame applied. Magnesium reacts with steam to liberate hydrogen and magnesium oxide. If zinc is heated to redness in a current of steam, hydrogen is liberated. Iron does not react with cold water, but readily reacts with excess steam at red heat. The above reaction can be made to proceed in the reverse direction by passing excess of hydrogen over heated triiron tetraoxide. Red-hot carbon reacts with steam at 1000ºC to give a mixture of carbon monoxide and hydrogen, known as water gas. Chlorine reacts with water to form a mixture of two acids. 1. Water can be recognized by its action of turning white anhydrous copper (II) sulphate to blue. The test, however, confirms the presence of water and not the absence of everything else except water. For example, a dilute sulphuric acid would turn anhydrous copper (II) sulphate from white to blue. That is why this test is called a physical test as opposed to a chemical test for water. 2. The presence of water can also be shown by the use of cobalt chloride paper. This is a filter paper impregnated with cobalt (II) chloride. The paper is blue in colour. The blue paper turns pink when in contact with water. Will turn anhydrous copper (II) sulphate from white to blue. Will turn anhydrous cobalt (II) chloride from blue to pink. To find out if a liquid is pure water, its boiling point or its freezing point must be measured. Pure water boils at exactly 100ºC and freezes at 0ºC at pressure of one atmosphere (760 mmHg). This is a chemical test for water. Water for domestic use is chiefly obtained from rivers, springs and wells; and sometimes from lakes and seas. However, lake and sea waters may be to too salty for drinking or washing and hence not normally used for such purposes. But for some countries, the sea is a major source of drinking water. However, this water must be desalinized (have its salt removed) and purified before being used for drinking. The process is very expensive. It involves an expenditure of big sums of money. It is only practised in developed countries. River and spring water must be boiled and filtered before drinking. At homes, water is normally boiled in big pans, cooled down, and then filtered by using a white, sterile and clean piece of cloth. 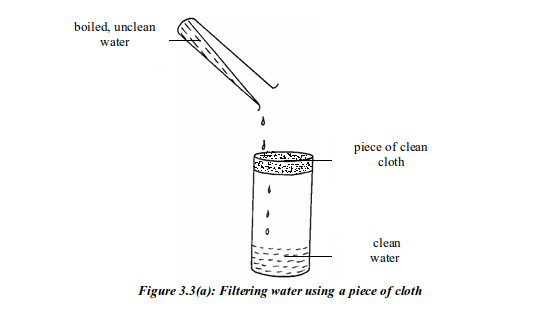 The cloth is tied around the mouth of the container as shown in figure 3.3(a). As water is poured through the cloth, the particles in it are filtered off. The clean water is then poured in clay pots or plastic buckets and placed in a cool place, or put in a refrigerator to cool down ready for drinking. 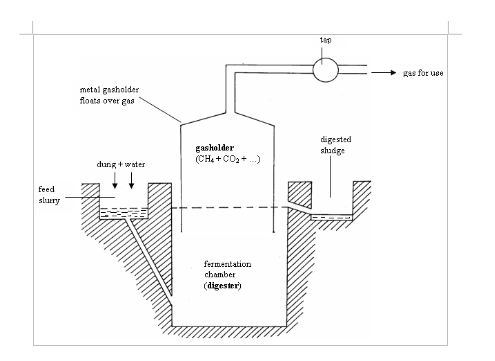 Alternatively, boiled water can be filtered using a funnel as shown in figure (b) bellow, but you must ensure the gravel, sand and cotton wool used are thoroughly sterile. Sterilization can be achieved by soaking the gravel and sand in hot boiled water for quite some time. The gravel traps any large floating substances. The coarse sand prevents small particles from passing through. The fine sand ensures even the small suspended particles do not pass through, while the cotton wool filters the very tiny particles. At home, water can also be purified with chemical purifiers. These chemicals are in liquid or tablet form. To purify water, a recommended amount of the purifier is added to a specific amount of water in a container. The water is shaken or stirred well. Then it is left to settle for at least 20 minutes before it can be safe for drinking and other domestic uses. To get the clearest water, it is advisable to filter the water thoroughly before adding the purifier. The commonest and most widely used purifiers are the waterguard and aquaguard. In developed countries, commercial filters may be used to purify water at home. These filters contain charcoal or ceramic element that purifies the water as it passes through the filter. bacteria – most are harmless, but some can cause diseases. dissolved substances – for example, calcium and magnesium compounds dissolved from rocks; and gases from the air. solid substances and debris – particles of mud, sand, grit, twigs, dead plants and perhaps tins and rags that people have dumped. All these impurities are gathered by water as it passes through different parts of land as rivers or streams. Before water is safe to drink, the bacteria and solid substances must be removed. 1. After water has been pumped through the screen to get rid of the larger bits of rubbish, it is pumped through a coarse filter which traps larger particles of solid. The filter could be beds of gravel and fine sand or anthracite. (iii) Aluminium sulphate in the form of potash alum, K2SO4.AL2(SO4)3.24H2O and slaked lime,Ca(OH)2are added for coagulating and precipitating all the suspended earthy material (clay matter). Bacteria and other microorganisms are captured by the coagulated mud, and precipitated. Sometimes instead of potash alum, iron (III) alum, (NH4)2.Fe(SO4)3.24H2Ocan be used. The aluminium hydroxide is bulky and sticky. Therefore, bacteria, microorganisms and small particles can stick to it and get precipitated. The calcium sulphate is by far denser than water. Both the solid products (aluminium hydroxide, plus organic and inorganic particles stuck on it, and calcium sulphate) sink to the bottom of the tank. The whole process is called sedimentation. 3. 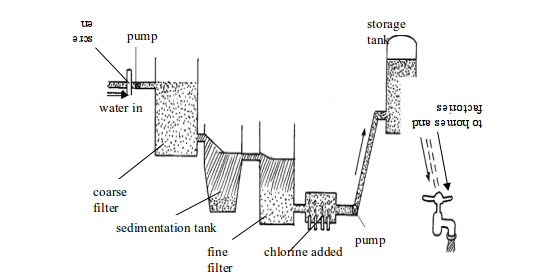 Water from the sedimentation tank is passed through a fine filter. The filter could be made of layers of sand, gravel or carbon granules with thousands of tiny pores. The carbon removes coloured matter, odours (tastes) and noxious smells from the water. Filtration beds are expensive to install and require considerable labour to maintain. 4. After filtering, the water is chlorinated and may be aerated. Chlorine is added to kill harmful bacteria. Chlorine is such a useful disinfectant that it is used in swimming pools to kill bacteria. In aeration, water is pumped through fountains and sprout into the air. Aeration kills many dangerous aquatic bacteria. In some countries and regions, water is fluorinated by adding sodium fluoride to the water supply to help prevent tooth decay. Finally, the water is pumped to storage tanks, and then to homes and factories. To kill harmful and disease-causing microorganisms such as bacteria, fungi, actinomycetes, amoeba, salmonella, etc. To remove solid substances and debris from the water such as tins, lags, plant remains, sand, algae, spirogyra, etc. To remove odour and unpleasant smells caused by different contaminants dissolved in water. To remove water hardness - sodium carbonate is added in water to remove both temporary and permanent hardness in water to make the water soft. Soft water forms lather easily with soap as compared to hard water which forms scum instead. This means that soft water requires less soap to form enough lather than hard water does. Therefore, soft water saves soap and hence money that could have been spent to purchase extra soap for washing. The sodium fluoride added to water in some areas helps to fight tooth decay. Water is one of the most vital natural resources for all life on earth. The availability and quantity of water have always played an important part in determining not only where people can live, but also their quality of life. Even though there always has been plenty of fresh water on earth, water has not always been available when and where it is needed, nor is it always suitable for all uses. Water must be considered as a finite resource that has limits and boundaries to its availability and sustainability for use. Where water supply is limited, conflicts may result between and among the various uses. The balance between supply and demand for water is a delicate one. The availability of usable water has and will continue to dictate where and to what extent development will occur. Water must be in sufficient supply for an area to develop, and an area cannot continue to develop if water demand far exceeds supply. Biological use: Water is essential to life. Most of the reactions in animals and plants take place in solutions in water. Plants absorb minerals from the soil in solution form. Animals and plants are found near or in areas where water can be found. Domestic use: Domestic water use is probably the most important daily use of water for most people. It includes water that is used in the home every day including water for normal household purposes such as washing clothes and dishes, drinking, bathing, food preparation, flushing toilets, and watering lawns and gardens, etc. Industrial use: Water is a valuable resource to the nation’s industries for such purposes as processing, cleaning, transportation, dilution, and cooling in manufacturing industries. Major water-using industries include cloth, steel, chemical, paper, and petroleum refining. Industries often reuse the same water repeatedly for more than one purpose. Water is used as a solvent in many industrial processes. It is also used for cooling certain parts of machines. Irrigation: Water is artificially applied to farm, orchard pasture, and horticultural crops, as well as leaching of salts from the crop root zone in sodic soils. Non-agricultural activities include self-supplied water to irrigate public and private flower gardens, loans, football pitches, etc. Crop production in areas that receive little rainfall per year can be achieved through the practice of irrigation. Water for irrigation purposes can be drawn from rivers, lakes, swamps and even from seas. Water as a solvent: Water is regarded as a universal solvent. It dissolves almost all substances. For this reason, it is used for dissolution of chemicals ranging from poisonous chemicals used in agriculture to non-poisonous chemicals used in hospitals, laboratories, research stations and for other general purposes. Cooling and heating: Due to its high specific heat capacity, water is used as a coolant for cooling automobile engines and other machines. Hot water is used during winter for heating homes in temperate countries. In higher plants, evaporation causes a cooling effect and therefore helps to cool plant organs. During hot weather, some animals tend to wallow in water in order to cool their bodies either through evaporation or by water itself. Habitat: Water is a habitat for fish and all aquatic animals and plants. Livestock use: This includes water for stock animals, feedlots, dairies, fish farms and other non-farm animals. In arid regions of Tanzania, the Government has constructed dams to supply water to cattle, and for some domestic uses. Mining: Water is used in mines for extraction of naturally occurring minerals: solids, such as coal and ores; liquids, such as crude petroleum; and gases, such as natural gas. This includes quarrying, milling (such as crushing, screening, washing, and flotation), and other operations as part of mining activity. Generation of electricity: Hydroelectric power is generated by river water. Fast-moving river water (especially in waterfalls and cataracts) is used to turn turbines to generate hydroelectricity that is supplied to homes, industries, towns, etc. Most of the electricity we use at home is generated by this means. Only a small portion is generated through other means. Navigation and recreation: People, goods and services can be transported via water bodies like rivers, lakes and oceans by using vessels such as boats, dhows, canoes and ships. Water is also used for sports such as swimming, canoeing, fishing, yachting, water skiing, and many other sports carried out on, in and under the water. Water is a very good solvent for many ionic substances. There are few substances, which do not dissolve in water to some extent. Even when you drink a glass of water, you are also drinking a little of the glass as well. The amount is very small indeed, but for certain experiments ordinary glass vessels cannot be used as containers for water because of this solvent effect. Water is the commonest solvent in use, but other liquids, are also important. The other solvents are generally organic liquids such as ethanol, propanone, trichloroethane, etc. These organic solvents are also important because they will often dissolve substances that do not dissolve in water. 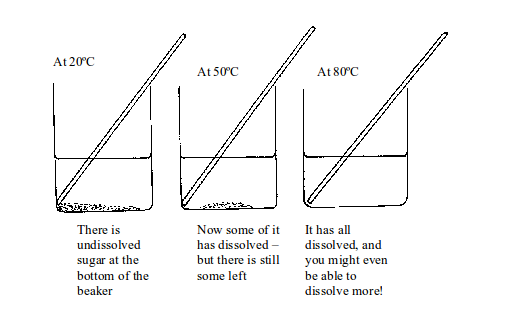 The following table shows an example of substances that dissolve in water. 6. Sodium, potassium and ammonium hydroxides… but other common hydroxides are insoluble. When salt is added to water and the mixture stirred, the salt dissolves. The product formed is termed as a solution. The solid that dissolves is known as a solute and the liquid (water) in which a solute dissolves is a solvent. We can continue to add more salt and stir until no more salt dissolves. At this point, the water has dissolved the maximum amount of salt possible. The amount of salt dissolved denotes the maximum amount of salt which can normally be held in solution. The solution made is called saturated solution. The amount of the salt that has dissolved is called the solubility of the salt in water. The solubility of a substance is usually expressed as the mass of the substance dissolved in 100g of water. Solubility is sometimes expressed in moles of solute per dm3 of solution at that temperature. To give a quantitative meaning to solubility, it is necessary to fix the amount of the solvent used and to state the temperature at which dissolution occurs. The amount of solvent is usually fixed at 100g. For example, the solubility of sugar (sucrose) at 20ºC is 240g in 100g of water. What is the maximum weight of sugar that will dissolve at 20ºC in a cup containing 350g of water? A saturated solution of a solute at a particular temperature is the one which will not dissolve any more of the solute at that temperature. The solubility of a solute in water at a given temperature is the maximum amount of it that will dissolve in 100g of water at that temperature. Generally, the solubility of a solute increases with increase in temperature. However, there are a few exceptions e.g. 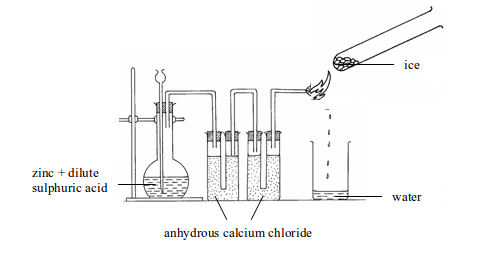 the solubility of calcium hydroxide decreases with increase in temperature. Sugar dissolves very slowly in water at room temperature (20ºC). Stirring helps to make sugar dissolve more quickly. But if you keep on adding sugar to the water even with continuous stirring, eventually no more sugar will dissolve. Extra sugar sinks to the bottom. The solution is saturated. Now let us look at what happens when you heat the sugar solution. If you heat the solution up to 20ºC there is still undissolved sugar at the bottom of the beaker. Increasing the temperature to 50ºC makes some sugar dissolve but there is still some left. But if the temperature is raised up to 80ºC all the sugar dissolves. You might even be able to dissolve more sugar! Therefore, sugar is more soluble in hot than in cold water. In fact, this is usually the case with soluble solids. If a solid is soluble in a liquid, it usually gets more soluble as the temperature rises. 2. The particles in it: Let us consider the dissolution of sodium chloride in water. When dissolved in water, the salt dissolves to form Na+ and Cl- ions. If sodium chloride is added to water, the Na+ ions will be attracted to the slightly negatively charged oxygen atoms of the water molecules whereas Cl- ions will be attracted to the slightly positively charged hydrogen atoms of the water. 3. The temperature of the solvent: As we saw early, the temperature affects the solubility of substances, particularly solids. The higher the temperature the higher is the solubility. As you can see, one compound of a metal may be slightly soluble while another is almost soluble (compare silver nitrate and silver chloride). It depends on particles. Put a weighed amount (say 2g) of potassium sulphate in a test tube. Add a little water from a measuring cylinder. Heat the test tube gently until the water is hot but not boiling. Add more water if necessary until the solid is just dissolved. Let the solution cool while stirring it with a thermometer. Note the temperature at which the first crystals form. Now look again at step 3. If you add a little more water, heat the solution again to make sure all the crystals have dissolved, and then let it cool, you will be able to find the solubility at a lower temperature. You can repeat this for a range of temperatures. 2 grams of potassium sulphate were dissolved in 12.5 cm3 of water. On cooling, the first crystals appeared at 60ºC. 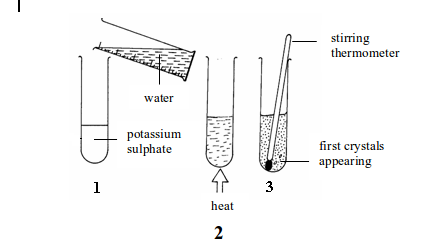 What is the solubility of potassium sulphate in water at 60ºC? 12.5 cm3 of water weighs 12.5g. Also, remember that solubility is measured by 100g of water. If 2g of the salt dissolved in 12.5g of water, then the amount of the salt in 100g of water. Therefore, the solubility of potassium sulphate in water at 60ºC is 16 grams. Solid solutes usually get more soluble in water as the temperature rises. The opposite is true for gases. Table 3.3 shows the solubility of different gases in water at different temperatures. Look at carbon dioxide. It is quite soluble in water at room temperature (20ºC). But when it is pumped into soft drinks under pressure, a lot more dissolves. Then when you open the bottle, it fizzes out of solution. Look at hydrogen chloride. At room temperature, it is over 14000 times more soluble than oxygen. Generally, the solubility of gases changes with temperature and pressure. It decreases with temperature and increases with pressure. The solubility of a particular solid in water can be measured over a range of temperatures up to 100ºC. The maximum mass of solid that will dissolve in 100g of water is found at each temperature. The values at each temperature can then be plotted to give a solubility curve. 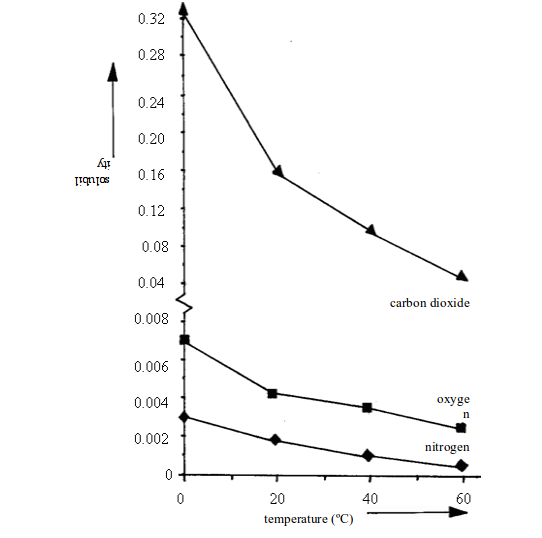 A curve that shows how the solubility of a substance changes with temperature is what we call a solubility curve. Table bellow shows the solubility of some salts in water at different temperatures. For most substances, solubility in water increases with increase in temperature. Table above shows the solubility of some salts in water at different temperatures. When the values for each salt shown on the table are represented on a graph paper, different solubility curves result. Look at the values in table above again. On a graph paper, use the same set of axes to plot solubility (vertical axis) against temperature (horizontal axis). Draw a smooth best-fit curve for each salt. Which of the salts is the most soluble at 15ºC? Which of the three salts is the most soluble at 55ºC? 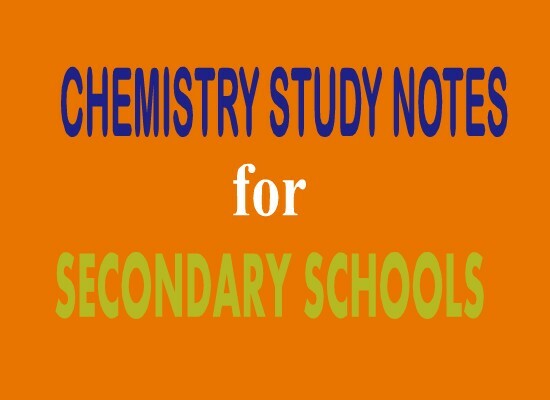 At which temperature do sodium chloride and potassium nitrate have the same solubility? 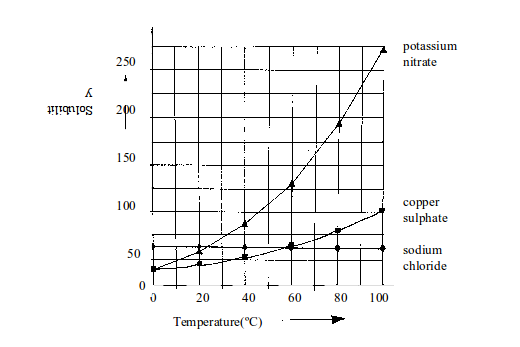 The curves in figure bellow show how the solubility of different salts changes with temperature. You can see that the solubility of most solids increases with increase in temperature. The increase for sodium chloride is very small and almost negligible. The increase for the other salts is as shown in the graph. For gases, the solubility decreases with increase in temperature. This means that decreasing the temperature will increase the solubility of gases. Figure 3.10 shows the solubility curves for some common gases. Compare these curves with those for solids in figure above. Data can be obtained from the solubility curves in various ways. For example, look at figure above. At 50ºC, 137.5g of potassium nitrate dissolve in 100g of water. At 40ºC, 62.5g of potassium nitrate dissolve in 100g of water. (b) What mass of potassium nitrate will crystallize out when a saturated solution in 100g of water is cooled from 50ºC to 40ºC? A fuel is a substance that can be combusted or burnt to release energy as a byproduct. The energy can be in the form of heat, light, electricity, sound etc. This energy can be harnessed to power machines or used for other purposes such as heating or lighting. Combustion is the burning of fuel with energy released as a byproduct. Fuel is a very important substance for the existence of a modern man. Examples of fuels include petroleum products (petrol, diesel, fuel oil, kerosene, spirits, etc), natural gas, coal, wood, charcoal, producer gas, water gas, etc. Wood: wood is obtained from logs or poles of trees. The wood used as fuel in Tanzania is obtained from natural and artificial forests. Wood fuel is mainly used in rural areas where there are no alternative fuels. Wood is also a major source of fuel used by government institutions such as schools, colleges, hospitals, and military institutions. Charcoal: This fuel is made by heating certain substances such as wood and bones in a limited supply of air. Wood charcoal is the main source of fuel in urban areas and in some townships. Coal: coal used in Tanzania is mined at Kiwira coal mines. It is used indirectly for generating electricity or directly for powering machines in processing and manufacturing industries and factories. The electricity generated from coal is used in such industries as Tanga cement and several other industries in Dar es Salaam. Natural gas: This gaseous fuel is mined at Songosongo in Kilwa (Lindi region), located in southern Tanzania. The gas is used as a fuel at homes and in small industries. It is also used to generate electricity that is used in various manufacturing and processing industries. The electricity generated from this gas is also sold to Tanzania Electricity Supply Company (TANESCO) who distributes the energy to its various clients. Petroleum products (kerosene, diesel, petrol, fuel oil, fuel gas, etc.) These petroleum fractions are obtained from crude oil by the process of fractional distillation of crude oil (petroleum). Diesel, petrol and oil are used in vehicles and other machines. Kerosene is used in kerosene lamps and stoves for heating at homes and for other general purposes. When we heat certain organic matter in a limited supply of air, we obtain a black, solid residue called charcoal. The organic matter can be from plant or animal sources for example, wood or animal bones. Heating a substance in limited supply of air is called destructive distillation. Wood or bone charcoal is made by the process of destructive distillation of wood or bones respectively. Charcoal is largely pure carbon. The entry of air during carbonization (destructive distillation) process is controlled so that the organic material does not burn down to ash as in conventional fire, but instead decompose to form charcoal. Cut wood into small pieces. Arrange the wood pieces into a pile of wood on the ground. Cover the pieces of wood with soil, leaving one open space for setting fire. Set fire to the wood and then cover the open space with soil. Make sure that the wood is burning. After the wood is burned, uncover the soil and pull out the black solid substance underneath. This is the charcoal. The dead vegetation collects in the bottom of the swamp. It may start to decay. But decay soon stops, because the microbes that cause it need oxygen, and the oxygen dissolved in the stagnant, warm water is quickly depleted. The vegetation is buried under debris. Over hundreds of thousands of years, the environment changes. Seas flood the swamps. Heavy layers of sediment pile up on the dead vegetation, squeezing out gas and water and turning it into peat. As the peat is buried deeper, the increasing heat and pressure compress it progressively to form different types of coal. Fuels can be classified into three groups according to the physical state of the fuel. A fuel can be in any of the three states of matter namely, solid, liquid or gaseous state. Solid fuels include wood, charcoal, peat, lignite, coal, coke, etc. The immediate use of all these fuels is for heating and lighting. However, these fuels have a long history of industrial use. Coal was the fuel for the industrial revolution, from firing furnaces to running steam locomotives and trains. Wood was extensively used to run locomotives. Coal is still used for generation of power until now. For example, in Tanzania the coal mined at Kiwira is used for generation of electricity. Also Tanga Cement Company uses coal as a source of power to run machines for production of cement. Wood is used as a solid fuel for cooking, heating or, occasionally, as a source of power in steam engines. The use of wood as a fuel source for home heating is as old as civilization itself. Wood fuel is still common throughout much of the world. It is the main source of energy in rural areas. Wood charcoal yields a large amount of heat in proportion to its quantity than is obtained from a corresponding quantity of wood, and has a further advantage of being smokeless. Wood charcoal is often used for cooking and heating, in blacksmithing, etc. Animal charcoal is used for sugar refining, water purification, purification of factory air and for removing colouring matter from solutions and from brown sugar. Animal charcoal is made by destructive distillation of animal bones. Coke is a fuel of great industrial use. Coke is obtained by destructive distillation of coal. Most of the coke produced in industry is used as a reducing agent in the production of metals such as pig iron. A substantial amount of coke is also used for making industrial gases such as water gas and producer gas. Coke is a better fuel than coal because when it is burning, it produces a clean and smokeless flame. When coal is used as a fuel, it produces many toxic gases during burning. Coke has high heat content and leaves very little ash. Coal is a complex mixture of substances, and its composition varies from one place to another. It depends on coal's age and condition under which it was formed. Anthracite is a very hard black coal and it is the oldest of all types of coal. When coal is heated in a limited supply of air, it decomposes. This thermal decomposition is called destructive distillation of coal. The products are coke, coal tar, ammoniacal liquor and coal gas. Liquid fuels include petrol (gasoline) diesel, alcohol (spirit), kerosene (paraffin), liquid hydrogen, etc. Liquid fuels have advantage over solid fuels because they produce no solid ashes, and can be regulated by automatic devices. They are relatively more convenient to handle, store and transport than solid fuels. Most liquid fuels in wide use are derived from fossils. Fossil fuels include coal, natural gas and petroleum. These fuels are formed from remains of sea plants and animals which lived millions of years ago. The remains became buried under layers of sediment. Immense heat and pressure resulted in the formation of coal gas and oil. Energy produced when petroleum products (diesel, petrol, kerosene, natural gas etc) are burned, originated from the sun. This energy was transferred to animals through their consumption of plants or plant products. When the animals died, got buried, and compressed by heat and pressure, they produced oil which gives off that energy when burnt. Petroleum fuels are used in cars and in various other machines. Fuels used in cars and lories (petrol and diesel), kerosene (for jet aircraft) and fuel oil (for ships), all came from crude oil. Some oil fuel is also used for electricity generation. Ethanol burns with a clean, non-smoky flame, giving out quite a lot of heat. On a small scale, ethanol can be used as methylated spirit (ethanol mixed with methanol or other compounds) in spirit lamps and stoves. However, ethanol is such a useful fuel that some countries have developed it as a fuel for cars. In countries where ethanol can be produced cheaply, cars have been adapted to use a mixture of petrol and ethanol as fuel. Brazil has a climate suitable for growing sugarcane. Ethanol produced by fermentation of sugarcane has been used as an alternative fuel to gasoline (petrol), or mixed with gasoline to produce "gasohol". Currently, about half of Brazil’s cars run on ethanol or "gasohol". "Gasohol" now accounts for 10% of the gasoline sales in the U.S.A. The idea about the use of biofuel for fuelling automobiles and other machines has been borrowed by other countries including Tanzania. However, the programme has raised a bitter concern among different activists. Their doubt is that emphasis on growing crops for biofuel production may take up land that could otherwise be used for growing food crops. This, therefore, would mean that there would not be enough land to grow enough food to feed the ever-increasing human population. Hence, hunger will prevail. Notwithstanding all these shouting, biofuel crop production is there to stay! The use of gaseous fuels for domestic heating is common in urban areas. Compressed gas that is delivered to our homes in steel cylinders is liquefied propane, butane, or mixture of the two. When the valve is opened, the liquid gas vapourizes quickly into gas and passes through a pipe to the stove. Gaseous fuels are the most convenient fuels to handle, transport and store. Fuel gas made from petroleum. Producer gas and water gas are important industrial fuels. Producer gas is produced by burning a solid carbonaceous fuel, such as coke, in a limited supply of air in a producer furnace. The reaction is exothermic and this makes coke to get hotter. Carbonaceous fuels are fuels that contain a high proportion of carbon. The producer gas is a mixture of carbon monoxide and nitrogen. As a fuel, producer gas burns to give out carbon dioxide. Because a good deal of producer gas contains nitrogen, a gas that does not support combustion, it has a lower calorific value compared to water gas. See table 4.2 for comparison. Water gas is produced by passing steam over white-hot coke at 1000°C. The gas is a mixture of hydrogen and carbon monoxide. The reaction is endothermic, causing the coke to cool. Water gas burns as a fuel to give carbon dioxide and steam. However, carbon monoxide is a very poisonous gas. The gas made from petroleum or coal contains some carbon monoxide, which makes it poisonous. Natural gas is safer and efficient, as it contains no carbon monoxide. It should be environmentally friendly (not harm the environment) in the course of its production and use, that is, it should not produce harmful or toxic products such as much smoke, carbon dioxide, carbon monoxide, sulphur dioxides, etc, which pollutes the air. It must be affordable to most people i.e. it must be cheap. It should not emit or produce dangerous by-products such as poisonous fumes, vapour or gases. It should have high calorific value i.e. it must burn easily and produce a tremendous quantity of heat energy per unit mass of the fuel. It should be easy and safe to transport, store, handle and use. It should be readily available in large quantities and easily accessible. It should have high pyrometric burning effect (highest temperature that can be reached by a burning fuel). Normally gaseous fuels have the highest pyrometric effect as compared to liquid and solid fuels. It should have a moderate velocity of combustion (the rate at which it burns) to ensure a steady and continuous supply of heat. A good fuel should have an average ignition point (temperature to which the fuel must be heated before it starts burning). A low ignition point is not good because it makes the fuel catch fire easily, which is hazardous, while high ignition point makes it difficult to start a fire with the fuel. A good fuel should have a low content of non-combustible material, which is left as ash or soot when the fuel burns. A high content of no-combustible material tends to lower the heat value of the fuel. The heating value or calorific value of a substance, usually a fuel or food, is the amount of heat released during the combustion of a specific amount of it. The calorific value is a characteristic of each substance. It is measured in units of energy per unit of substance, usually mass, such as Kcal/Kg, J/g, KJ/Kg, KJ/Mol, MJ/m3, etc. Heating value is commonly determined by use of an instrument called bomb calorimeter. By custom, the basic calorific value for solid and liquid fuels is the gross calorific value at constant volume, and for gaseous fuels, it is the gross calorific value at constant pressure. Heat gained by the water = heat given out by the fuel. Pour a measured volume of water into the tin. Since you know its volume you also know its mass (1 cm3 of water has a mass of 1g). Weigh the fuel and its container. Measure the temperature of the water. Light the fuel and let it burn for a few minutes. Measure the water temperature again, to find the increase. Reweigh the fuel and container to find how much fuel was burned. Energy given out = 4.2g-1C-1 mass of water (g) its rise in temperature (ºC). Then since you know what mass of fuel you burned you can work out the energy that would be given out by burning one mole of it. The energy/heating/calorific value of a fuel refers to the amount of heat given out when a specific amount of fuel is burned. Aim: To find out the energy value of ethanol. 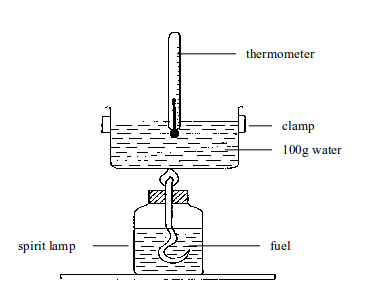 Materials: water, beaker, thermometer, weighing balance, spirit lamp and ethanol. Pour a known volume of water into a beaker. Fill the spirit lamp with enough ethanol. Weight the mass of both the ethanol and the lamp. Light the lamp and let it continue burning for a few minutes before putting it off. Reweigh the ethanol and its container to find how much ethanol was burned. Repeat similar procedures with kerosene, charcoal, coal, firewood etc. and compare your results. Which fuel has more energy per gram? That is the most efficient fuel. How reliable is the experiment? The following table compares the experimental results with values from data book. Heat loss: Not all the heat from the burning fuel is transferred to the water. Some is lost to the air, and some to the container that holds the fuel. The less oxygen there is, the more carbon monoxide and carbon will form. Its reaction with oxygen produces just water. No pollution to the environment! It is a ‘renewable’ resource. It can be made by electrolysis of acidified water. As cheaper sources of electricity for electrolysis are developed, this may become an attractive option. 2. Cooking and heating: Fuels like wood, liquefied gas (propane or butane or a mixture of the two), charcoal and kerosene are burned to provide energy for cooking and heating. When burned, these substances provide enough heat to cook food and even heat different substance at home. Inhabitants of cold countries in temperate regions of the world burn different kinds of fuels to produce heat for heating homes and water. 3. Generation of electricity: The machines and devices responsible for electricity production and supply are fuelled by heavy liquid fuels such as diesel, fuel oil, etc. Most generators use liquid fuels such as petrol and diesel to generate electricity. So, fuels play an important role in electricity production. In Tanzania, coal from Kiwira mines is used for generation of electricity used in Tanga Cement Factory and some industries in Dar es Salaam. This is why escalation of crude oil in the world market results to increased cost of electricity supplied to homes and industries. In developed countries, uranium is used as a fuel to generate electricity which is used at homes and in industries. 4. Lighting: Kerosene is used in paraffin lamps, tin lamps and hurricane lamps by the rural communities to light homes. The use of paraffin is important in rural areas of Tanzania where 90% of the total population stay and earn their living. It is estimated that only 10% of the population have access to electricity. So, you can see how crucial this fuel is to the majority of the people. 5. Industrial uses: Industrial operations such as welding and metal fabrication make use of oxyacetylene flame which produces extremely high heat to melt and cut metals. 6. Other alternative uses: manufacture of different kinds of products such as petroleum jelly, nylon and plastic. Trees are the most common source of fuels in developing countries like Tanzania. Fuels from trees are mainly used for domestic purposes. People cut down trees for firewood and for burning charcoal that is mainly supplied to urban areas to be used as fuel. Because of the rapidly growing human population, the demand for trees as a source of fuel has ever increased to the extent that this resource is no longer sustainable. The act of cutting down trees for firewood, charcoal, timber, and for obtaining logs that are shipped to overseas has made this resource to be depleted. This leads to environmental destruction, a result that causes many problems to the human society and other organisms as well. Trees have several advantages apart from providing us with fuels. Trees help in the attraction of rainfall and conservation of water sources in various areas. Trees also help in removing bad gases from air such as carbon dioxide that is emitted to the atmosphere due to various human activities. In so doing, trees help to maintain the balance of gases in the atmosphere. Trees and other vegetation provide habitats and shelters for wild animals and birds of the air. Presence of trees also help to maintain the survival of microorganisms found in the soil, which are important for the balance of nature. Trees can make our country look beautiful and hence attract local and foreign eco-tourists, a fact which can contribute to our country’s revenue, and economic growth. 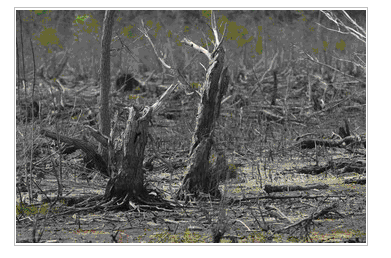 Deforestation results to scarcity of rainfall as we are experiencing these years. This is because trees attract rainfall. Scarce rainfall leads to drought. Prolonged drought causes famine. Therefore, people will suffer from famine if they continue to use firewood or charcoal as their sources of fuels. The other effect is soil erosion, which leads to loss of soil fertility. Trees act as a soil cover, which makes the soil resist the impact of raindrops. Deforestation means removal of the soil cover and hence making the soil bare. It is obvious that tree cutting for firewood or charcoal will expose the soil to agents of soil erosion such as wind, water and animals. This will make the soil more prone to erosion. So long as plants depend on the top soil (which contains more plant nutrients) for survival and existence, an eroded soil will consequently support very few or no vegetation at all. The aftermath of this is soil aridity. As noted early, trees help absorb excess carbon dioxide produced by respiring living organisms. Cutting down trees will lead to excessive accumulation of carbon dioxide in air. Carbon dioxide, among other gases, is responsible for excessive heating of the earth, a phenomenon called global warming. This is because the gas forms a layer in the atmosphere that acts as a blanket. The layer of carbon dioxide gas so formed prevents heat emitted by the heated earth from escaping to the upper atmosphere. This causes extreme heating of the earth’s surface. Consequences of global warming are many, the worst being drought that could ultimately lead to extinction of plant and animal species. Therefore, it is important to plant more trees and to reduce our dependence on trees for fuels in order to improve our environment. Tree planting campaign should be a regular practice and the trees that have already been planted should be cared for. Natural forests should be conserved. Local Governments should be encouraged to make and enforce the bylaws against those people cutting down trees carelessly for charcoal burning. At the same time, the central Government must look for the alternative energy sources for her citizens urgently. Energy is defined as the ability to do work or bring about change. Energy makes changes; it does things for us. It moves cars along the road, and boats over the water. It bakes cakes in the oven and keeps ice frozen in the freezer. It plays our favourite songs on the radio and lights our homes. Energy makes our bodies grow and allow our minds to think. People have learned how to change energy from one form to another so that we can do work more easily and live more comfortably. The source of all energy on earth is the sun. Energy exists in many different forms such as heat, light, sound, electrical, etc. The amount of energy can be measured in joules, kilojoules, megajoules, calories, etc. There are many forms of energy, but they can all be put in two categories: Kinetic and Potential. Kinetic energy is energy in motion of waves, electrons, atoms, molecules, substances, and objects. Potential energy is stored energy and the energy of position - gravitational energy. Electrical energy is the movement of electrical charges. Everything is made of tiny particles called atoms. Atoms are made of even smaller particles called electrons, protons and neutrons. Applying a force can make some of the electrons move. Electrical charges moving through a wire is called electricity. Lightning is another example of electrical energy. Chemical energy is energy stored in the bonds of atoms and molecules. This energy holds these particles together. Biomass, petroleum, natural gas, and propane are examples of stored chemical energy. Radiant energy is electromagnetic energy that travels in transverse waves. Radiant energy includes visible light, x-rays, gamma rays and radio waves. Light is one type of radiant energy. Solar energy is an example of radiant energy. Stored mechanical energy is energy stored in objects by the application of a force. Compressed springs and stretched rubber bands are examples of mechanical energy. Thermal energy, or heat energy, is the internal energy in substances caused by the vibration and movement of the atoms and molecules within substances. Geothermal energy is an example of thermal energy. Nuclear energy is energy stored in the nucleus of an atom - the energy that holds the nucleus together. The energy can be released when the nuclei are combined or when a nucleus splits apart (disintegrates). Nuclear power plants split the nuclei of uranium atoms in a process called fission. The sun combines the nuclei of hydrogen atoms in a process called fusion. Scientists are working creating fusion energy on earth, so that someday there might be fusion power plants. Motion energy is the energy which enables movement of objects and substances from one place to another. Objects and substances move when a force is applied according to Newton's laws of motion. Wind is an example of motion energy. Gravitational energy is the energy of position or place. A rock resting at the top of a hill contains gravitational potential energy. Hydropower, such as water in reservoir behind a dam, is an example of gravitational potential energy. Kinetic energy is energy in motion. Its existence can be shown by winds, ocean currents, running water, moving machines or a falling body. Potential energy is energy at rest. It is found stored in different forms, e.g. in coal, petroleum and natural gas, batteries and muscles. Such energy does not work so long as it is stored. It is capable of doing work when it is converted to other forms of energy such as heat, light or radiation. Can energy be created or destroyed? When wood or charcoal is burned, it appears as if energy is destroyed and wasted. In fact, the energy in these kinds of fuels is not destroyed when the fuels are burned. It is simply converted to other forms of energy such as heat and light. When you are seated on a desk in class, you are possessing potential energy. When you stand up and walk away from the classroom, you are transforming the potential (chemical) energy in your muscles to kinetic energy. The Law of Conservation of Energy states that energy can neither be created nor destroyed but it can only be changed from one form to another. When we use energy, it does not disappear. We simply convert it from one form to another. Potential (chemical) energy in a dry cell is converted to electrical energy which is finally converted to sound energy in radio speakers. In a tape record player, the same chemical energy is ultimately converted to kinetic energy to drive the cassettes. When the potential energy is all used up, the batteries are dead. In the case of rechargeable batteries, their potential energy is restored through recharging. Muscles chemical to kinetic, etc. All energy changes that occur during chemical and physical changes must conform to the Law of Conservation of Energy, that is, energy can only be changed from one form into its equivalent of another form with no total loss or gain. The most common form of energy in chemistry is the heat change. A chemical reaction must involve some change in energy. As the reaction occurs, chemical bonds of reactant molecules are broken while those of the product molecules are formed. Energy is given out when a chemical bond forms and it is consumed when a bond is broken. During respiration process, the bonds of glucose and oxygen are broken down while those of carbon dioxide and water are formed. Heat is absorbed when chemical bonds are broken and it is released when the bonds are formed. The total amount of heat absorbed by the reactants is equal that released by the products. Heat absorbed is given a positive sign (+ve) while heat given out is assigned a negative sign (-ve). So the total energy change is equal to zero. This means that no energy has been created or destroyed. Renewable energy sources include biomass, geothermal energy, hydroelectric power, solar energy, wind energy, and chemical energy from wood and charcoal. These are called renewable energy sources because they are replenished within a short time. Day after day, the sun shines, wind blows, river flows and trees are planted. We use renewable energy sources mainly to generate electricity. In Tanzania most of the energy comes from non-renewable sources. Coal, petroleum, natural gas, propane and uranium are examples of non-renewable energy sources. These fuels are used to generate electricity, heat our homes, move our cars and manufacture many kinds of products. These resources are called non-renewable because they cannot be replenished within a short time. They run out eventually. Once, for example, coal or petroleum is depleted, it may take millions of years to be replaced. So, these are non-renewable energy sources. Biogas is a gaseous fuel produced by the decomposition of organic matter (biomass). Under anaerobic conditions, bacteria feed on waste organic products, such as animal manure and straw, and make them decay. The product formed from this decay is called biogas, which consists mainly of methane, though other gases such as carbon dioxide, ammonia, etc, may also be produced in very small quantities. The biogas produced can be used as a fuel for cooking, heating, etc. Raw materials for biogas production may be obtained from a variety of sources, which include livestock and poultry wastes, crop residues, food processing and paper wastes, and materials such as aquatic weeds, water hyacinth, filamentous algae, and seaweeds. The organic waste products are fed in a biogas plant. Prior to feeding the material into the plant, the raw material (domestic poultry wastes and manure) to water ratio should be adjusted to 1:1 i.e. 100 kg of excreta to 100 kg of water. Then adequate population of both the acid-forming and methanogenic bacteria are added. The bacteria anaerobically feed on the liquid slurry in the digester. The major product of this microbial decomposition is biogas, which largely contain methane gas. The gas so produced is collected in the gas holder and then taped off. The gas is used as a fuel for cooking, heating and other general purposes. Domestic sewage and animal and poultry wastes are examples of the nitrogen-rich materials that provide nutrients for the growth and multiplication of the anaerobic organisms. On the other hand, nitrogen-poor materials like green grass, maize stovers, etc are rich in carbohydrates that are essential for gas production. However, excess availability of nitrogen leads to the formation of ammonia gas, the concentration of which inhibits further microbial growth. This can be corrected by dilution or adding just enough of the nitrogen-rich materials at the beginning. In practice it is important to maintain, by weight, a C:N close to 30:1 for achieving an optimum rate of digestion. The C:N can be manipulated by combining materials low in carbon with those that are high in nitrogen, and vice versa. A pH range for substantial anaerobic digestion is 6.0 – 8.0. Efficient digestion occurs at a pH near to neutral (pH 7.0). Low pH may be corrected by dilution or by addition of lime. To ensure maximum digestion, stirring of the fermentation material is necessary. Agitation (stirring) can be done either mechanically with a plunger or by means of rotational spraying of fresh organic wastes. Agitation ensures exposure of new surfaces to bacterial action. It also promotes uniform dispersion of the organic materials throughout the fermentation liquor, thereby accelerating digestion. The biogas plant consists of two components: the digester (or fermentation tank) and a gas holder. The digester is a cube-shaped or cylindrical waterproof container with an inlet into which the fermentable mixture is introduced in the form of liquid slurry. The gas holder is normally an airproof steel container that floats on the fermentation mix. By floating like a ball on the fermentation mix, the gas holder cuts off air to the digester (anaerobiosis) and collects the gas generated. As a safety measure, it is common to bury the digester in the ground or to use a green house covering. Biogas does not produce much smoke or ash, which could otherwise pollute the atmosphere or land. When the gas is burned it produces very little smoke and no ash as compared to other sources of fuel such as wood. The use of biogas for cooking and heating prevents the cutting down of trees to harvest firewood, or burn charcoal for fuel, a practice that could result to soil erosion, drought, etc. Hence, using the biogas as fuel helps to conserve the environment as no more cutting of trees may be done. Using cow dung, poultry manure and other excreta for biogas production helps keep the environment clean because these materials are put into alternative use instead of just being dumped on land, a fact that could lead to pollution of the environment. Some biomass employed in biogas production is toxic and harmful. By letting these materials be digested by bacteria, they may be turned into non-toxic materials that are harmless to humans, plants, animals and soil. The excreta used for production of biogas produce foul smell if not properly disposed of. Using this excrete to generate biogas means no more bad smell in air. Health hazards are associated with the use of sludge from untreated human excreta as fertilizer. In general, a digestion time of 14 days at 35ºC is effective in killing the enteric bacterial pathogens and the enteric group of viruses. In this context, therefore, biogas production would provide a public health benefit beyond that of any other treatment in managing the rural health and environment of developing countries.